The Emperor X drumheads are the most durable Mylar® heads in the world. Theyre made with two free-floating plies of 10-mil Mylar® film with a 5-mil reverse black dot, which gives consistent focused warm tones which accounts for their popularity among many of todays hardest hitting Rock drummers. The EMPEROR X is the thickest snare head ever made by REMO®. It was changed into a production item after more and more artists began ordering them as custom heads. Mike Fasano (Warrant) who was the first to create the buzz about the new 20-mil head, loved the idea of a snare head with this much attitude. He in turn got John Tempesta (Rob Zombie) and Matt Sorum (Velvet Revolver), Tre Cool (Green Day) and Travis Barker (The Transplants) hooked on the new head too, and the list continues to grow. Marketing efforts have fueled the demand in stores and made this one of our best introduced heads ever. For hard hitters, youll love the sound and durability. 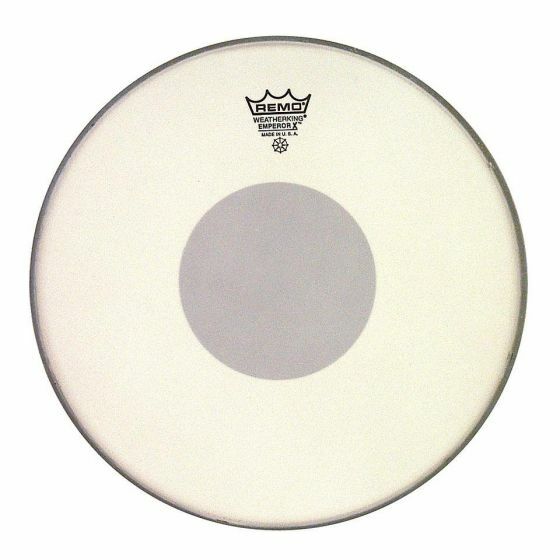 BX-0114-10 The Emperor X drumheads are the most durable Mylar® heads in the world. Theyre made with two free-floating plies of 10-mil Mylar® film with a 5-mil reverse black dot, which gives consistent focused warm tones which accounts for their popularity among many of todays hardest hitting Rock drummers. The EMPEROR X is the thickest snare head ever made by REMO®. It was changed into a production item after more and more artists began ordering them as custom heads. Mike Fasano (Warrant) who was the first to create the buzz about the new 20-mil head, loved the idea of a snare head with this much attitude. He in turn got John Tempesta (Rob Zombie) and Matt Sorum (Velvet Revolver), Tre Cool (Green Day) and Travis Barker (The Transplants) hooked on the new head too, and the list continues to grow. Marketing efforts have fueled the demand in stores and made this one of our best introduced heads ever. For hard hitters, youll love the sound and durability. Slagvel Remo Emporer X 14" coated voor € 25,00 bij https://www.vanderglas.nl/.